Lampley: Andre Ward wants Golovkin fight! (Photo credit: Sumio Yamada) By Dan Ambrose: HBO commentator Jim Lampley says he was contacted by the lawyer for WBA Super middleweight champion Andre Ward (27-0, 14 KOs) who told him that Ward is willing to fight WBA Super World middleweight champion Gennady Golovkin (31-0, 28 KOs) for a fight. Presumably, Golovkin would have to move up to super middleweight to face Ward at either a catch-weight or at the full weight in order for the fight to happen. Lampley believes that Andre Ward or Carl Froch, two of the top super middleweights in the division, might be the direction for Golovkin to go in if he can’t get the top names at middleweight  to agree to fight him. Golovkin obviously would prefer to fight Miguel Cotto and Saul “Canelo” Alvarez than Ward, because it would likely be a much bigger fight in terms of money and fan interest. Fights against Cotto and Canelo would be pay-per-view fights on HBO. It’s unclear whether a Golovkin-Ward fight would sell on HBO pay-per-view. It’s quite possible it would bring in a very, very low number of pay-per-view buys, because neither Ward nor Golovkin have ever fought on pay-per-view before. Ward’s situation is further hurt by his inactivity. Ward hasn’t fought since last year in November when he beat Edwin Rodriguez. In the last two years, Ward has fought just once per year. He fought one time in 2012 and once in 2013. In contrast, Golovkin fought four times in 2013, and three times in 2013. “If he can’t get a fight at 160, maybe he has to go to 168 a Carl Froch,” Lampley said to HBO. “A representative from Andre Ward’s camp sent me a note this morning that Andre wants to fight him. He’ll fight him anywhere, anyplace, and anytime. A fight against Andre Ward in Southern California would be very marketable. Ward’s lawyer sent me an e-mail today saying he’ll fight him wherever,” Lampley said. I doubt Golovkin is going to agree to fight Ward. Golovkin’s promoter Tom Loeffler is looking to put him in with big names in the middleweight division. Loeffler is open to having Golovkin move up in weight to fight Froch or Mikkel Kessler, but those are big names against guys with huge fan bases. Ward arguably doesn’t have the same kind of support as those fighters do in their own home countries. Kessler and Froch bring in huge ratings when they fight, and that explains why Loeffler would be willing to match Golovkin against them at super middleweight. “That would be a wonderful fight,” Roy Jones Jr said in speaking of a Golovkin vs. Ward fight in California. “If I was promoting him that’s exactly what I would do if I was Andre, because Andre needs opponents that will stand in front of him that would make it a chess match. Golovkin is the perfect guy for Andre Ward to fight. I would love to see that fight. It would be a great fight for the network and for the fans,” Jones Jr said. Golovkin vs. Ward would be a good fight, but I could also see it one with a lot of smothering, wrestling and holding done by Ward like we’ve seen in some of his fights. He likes to force his opponents up against the ropes and keep them there by leaning on them, and wrestling around. That’s not a great style match-up for a guy like Golovkin, who doesn’t do a lot of holding and wrestling. A fight between Ward and Golovkin would likely be very similar to the 2005 fight between a young Ricky Hatton and an aging Kostya Tszyu. In that fight, Hatton smothered Tszyu’s offense by wrestling with him, staying close, and keeping him pinned against the ropes by pressing his upper body against him. The referee let Hatton smother Tszyu without pulling them apart for long stretched despite the fact that much of it was just ugly wrestling on Hatton’s part. When there was space between them, Tszyu generally got the better of Hatton. 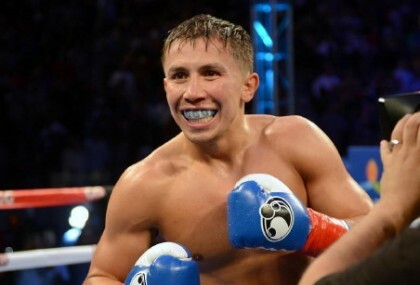 If Golovkin were to agree to fight Ward, he would very likely be stuck fighting a 12 round wrestling type of fight that wouldn’t resemble any of Golovkin’s past fights. Further, Golovkin would be at a huge size disadvantage against the 6’0” Ward, who not only would have a height advantage over him, but also a likely significant weight advantage as well. “I think it says something that the only top fighter that seems willing to get in the ring with Golovkin might be the best pound for pound fighter in the world who’s in his physical prime, an Olympic Gold medalist who hasn’t lost since he was 12-years-old,” Max Kellerman of HBO said about Andre Ward. “[He’s] cleaned out his division, and by the way, he has a size advantage against Golovkin. Andre Ward is the only guy who seems to want him, and that’s because you see what Golovkin does to the also-ran middleweights, the contenders, but not the champions. He absolutely destroys them. There are no surprises; he’s not going to be upset by a mediocre fighter. He seems like the real deal. So the fans are responding, and as a result, maybe now Golovkin has the economic clout to get other top fighters not named Andre Ward. I don’t know how anxious they’re going to be to want to get in with maybe the fighter in boxing who also has a size advantage on them just yet. But maybe other fighters not named Andre Ward will accept the Golovkin challenge, because it will be worth their while or worth it to their bottom line now,” Kellerman said. Golovkin is better off fighting Canelo or Cotto, because at least those guys weigh around the same amount as him in the ring. Golovkin wouldn’t be giving away 10 pounds or more in stepping inside the ring with them, and he wouldn’t be stuck with 12 rounds of wrestling. It’s interesting that Lampley, Jones Jr and Kellerman aren’t putting pressure on Ward to move up a division and fight WBO light heavyweight champion Sergey Kovalev, Artur Beterbiev, or Adonis Stevenson at 175. They want Golovkin to move up in weight to fight Ward, but they’re not putting the same thing on Ward in moving up in weight to get fights. Boxing » Andre Ward » Lampley: Andre Ward wants Golovkin fight!